Riding glasses are essential for eye safety. When a flying pebble impacts the eye at highway speeds, the result isn’t much different from getting hit in the eye with a pellet gun. It’s the principle of relative motion in action. Speeds add, so it doesn’t matter which is moving or which is at rest, the eye suffers the same impact. That’s why quality riding glasses are ANSI Z87.1 rated. However, safety doesn’t end with impact protection. If poor lighting conditions cause a bad accident, then serious injury happens to other parts of the body, and possibly to the eyes as well. Poor lighting occurs in many ways. Extremely bright lighting causes eye fatigue. This leaves you feeling tired and diminishes alertness and reaction time. Tinted riding glasses should take care of this except that brightness levels change throughout the day, depending on the sun’s position in the sky. Changes in cloud cover, riding through tunnels, and variable shading, such as riding in and out of tree cover all contribute to fluctuating brightness levels. Tinted glasses that are perfect for one brightness level are less than optimal and possibly even dangerous for others. Glare is another form of poor lighting, which is caused by extreme contrasts in brightness between different objects or between different fields of your vision. A low hanging sun, sunlight reflections off wet pavement or from a window of a car will blind you to the rest of the road. 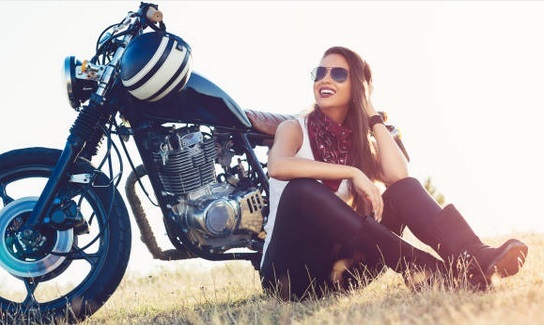 Without some kind of glare protection, even a few seconds of blinding glare can cause an accident, especially when riding at high speeds. Yet another problem is dim lighting on overcast days and especially when riding in fog. It’s clear that a pair of riding glasses with a fixed tint aren’t up to the task in many situations. Even ordinary photochromic lenses, which adjust their tint to brightness levels, are inadequate because they only react to UV, which is partially blocked by your windscreen. They also fail to become sufficiently dark even when exposed to direct sunlight and they don’t activate rapidly enough to deal with the lighting changes encountered when riding. However, there are two alternative eyewear technologies that overcome these limitations. These are Transitions XTRActive and Transitions Drivewear riding glasses. Like ordinary photochromic lenses, Transitions XTRActive riding glasses change their tint darkness according to lighting levels. However, XTRActive lenses react quickly to the changing lighting intensities typical of motorcycling. They are activated by both ultraviolet and visible light, which means you can count on their effectiveness whether looking off to the side or through a UV-blocking windscreen. And you will find that they get sufficiently dark and therefore will protect your vision in the brightest lighting conditions. 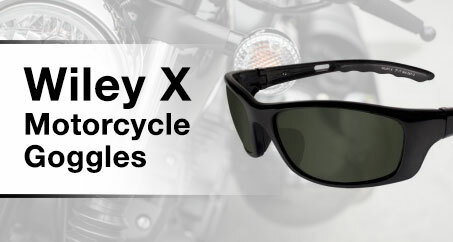 If you do a lot of summer riding in the desert or other warm areas of the country, Transitions XTRActive riding glasses will quickly activate. High temperatures do not slow their reaction times, unlike ordinary photochromic glasses. In addition, Transitions XTRActive lenses completely block both UVA and UVB. Like Transitions XTRActive riding glasses, Transitions Drivewear also react quickly to changing lighting, are activated by UV and visible light, and they’ll darken sufficiently to provide protection in bright sunlight. They also provide full UVA and UVB protection. However, one of their biggest differences is how they react to varying brightness levels. Rather than changing the darkness of a particular tint, such as gray, in the case of Transitions XTRActive, Transitions Drivewear will change their color. Why does this matter? Because the color change provides both protection from brightness, as well as improved contrast perception. It’s well known that tint color affects contrast perception, depending on specific environmental conditions. Contrast perception is important when riding. Without it, you couldn’t discern one object from another. This problem often happens in low lighting conditions such as early morning or late evening, and especially in foggy conditions. Deer collisions, for example, mostly occur during dawn or dusk. Fog, on the other hand, is notorious for causing accidents, including massive pileup crashes. Under these poor lighting conditions, Transitions Drivewear changes to a green/yellow tint. This is ideal for good contrast perception, even in the fog. In moderate light, Transitions Drivewear changes to a copper tint. This provides protection from glare encountered at this lighting level. Copper tint improves depth perception. This allows you to react more quickly to changes in traffic speed and makes it easier to pull into traffic from a side road. Copper also improves perception of traffic signal colors such as green and red. In bright light, Transitions Drivewear changes to a dark reddish-brown tint. This color provides excellent protection from the bright sunlight encountered during midday. Because of its lens color changes, it seems that Drivewear has the edge over Transitions XTRActive eyewear. However, this isn’t necessarily the case. Drivewear is intended for outdoor use during the daytime only. Transitions XTRActive also work indoors and will provide light tinting in the presence of artificial light. This is convenient when going inside a store, service station, or restaurant during a ride. Continually taking them off and putting them back on again increases your risk of losing, dropping, or damaging the eyewear. Some people are less interested in contrast enhancement and prefer to see colors in their natural state. This is best provided by gray tinted XTRActive lenses. However, one feature not covered yet is lens polarization. Although Transitions XTRActive provides glare protection, it doesn’t have the lens polarization of Drivewear riding glasses. Polarized lenses are unique because they completely block out reflected glare from horizontal surfaces such as wet pavement, a field of snow, as well as most of the glare reflected from the rear window of a car in front of you. Polarized lenses also improve vision on hazy days, because about half of the sunlight reflected from haze droplets are horizontal reflections. In addition, with Drivewear, you get the glare reduction provided by tint as well as that provided by polarization. Which should you choose? If you ride in a variety of daytime outdoor conditions, perhaps Transitions Drivewear riding glasses are best for you. If you like the convenience of wearing your eyewear indoors and only require variable tinting, then Transitions XTRActive riding glasses might be the right choice. If you are undecided about which to get, contact us today for more information.